You say all your favorite plants are pooping out in the summer heat and your garden is beginning to resemble a vast wasteland? You say you can't afford any more of those humongous water bills and whatever is still alive in your yard is going to have to make it on its own from here on out? Well, have I got a plant for you. 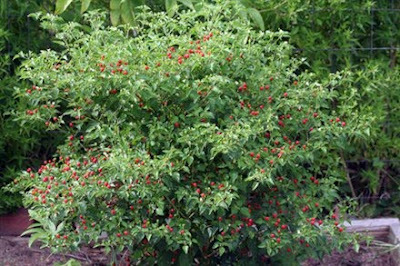 This is a plant that makes a nice 3' X 3' shrub that can grow in full sun, part shade, or even in shade. Mine is growing in full sun and that means about nine hours of unrelenting sunshine in the spot where it lives. I have seen the plant now at all hours of the day and under all conditions and I have never seen it wilt. Its water needs are minimal. It covers itself in pretty little white blooms and these are followed quickly by tiny green fruits that soon turn red, creating a very ornamental appearance. Best of all it is a native plant and birds love it. It is Chile pequin (Capsicum annuum), also known as turkey pepper or bird pepper. 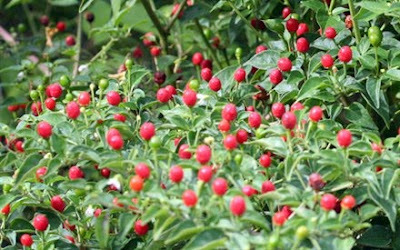 It is a cayenne pepper and its fruits are rumored to be on the hot side, although I can't personally say because I haven't tested them. I always leave them for the birds. Here is a close-up view of the fruits. My plant is now covered in these little fruits but it is still in bloom as well. The plant blooms fully six months of the year from May through October. This is the first year that I have intentionally grown Chile pequin. In the past, it has been planted in my garden by birds, usually in inconvenient spots. Nevertheless, I have usually let the plants grow when I discover them because I know they are favorites with the birds. Last spring when I happened upon some of the plants at one of the nurseries that I frequent, I decided to actually plant one on purpose and see how it turned out. I planted it in a bed in the veggie/herb garden. My only regret now is that I didn't buy several of the plants and that I didn't plant them in more conspicuous places. Live and learn. Next year I will. If you are looking for a plant that you can basically stick in the ground and forget and still have a very pretty showy shrub from it, Chile pequin may very well be your plant. If you've never grown it, put it on your wish list and give it a try next year. I think you'll become a fan of the plant even as the birds and I have.